It’s been so HOT recently! BIG SUN~ NO RAIN~ I remember reading from somewhere about MRT breaking down more often than it rains in Singapore! Man~ with this kinda weather, I’m really not motivated to step out of the house.. I don’t want more freckles or even duller skin. But good thing is that I know I will have a good treat when I reached home after a day of “sun tanning” outside!! Yup! 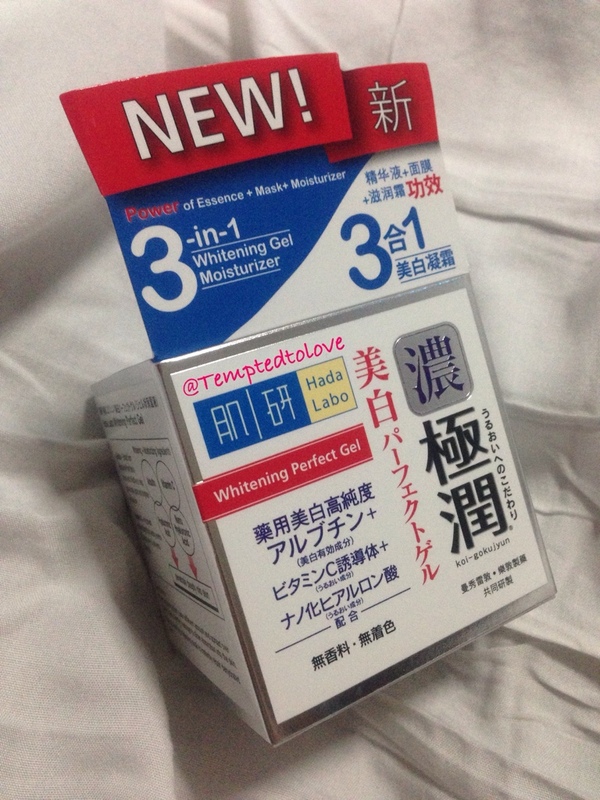 It’s Hada Labo Whitening Perfect Gel!! Very interesting product I swear!! 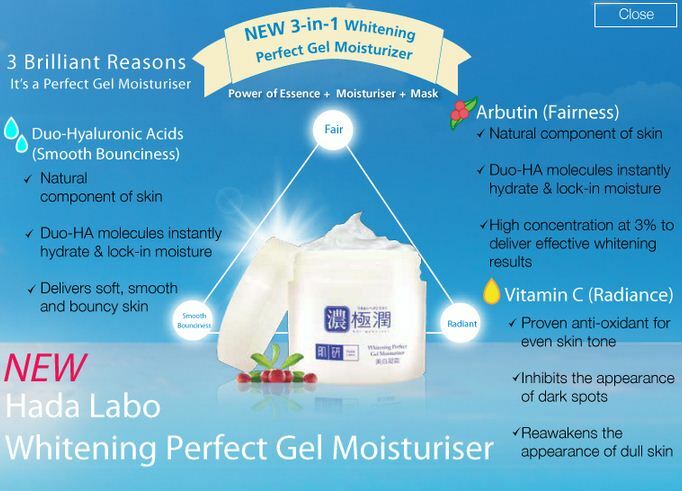 Hada Labo launches the NEW 3-in-1 Arbutin Whitening Perfect Gel for fair, bright and bouncy skin! Fast absorbing and non-oily in texture, this whitening gel boosts 3-in-1 skincare product beneﬁts of Essence + Moisturiser + Paper Mask! Natural Arbutin: High concentration levels at 3% of Japanese pharmaceutical-level Arbutin to offer effective whitening results. Enhances skin fairness and targets dark spots. Efﬁcacious Vitamin C Concentrate: Proven anti-oxidant enhances collagen production, inhibits the appearance of dark spots and reawakens the appearance of dull skin. Hyaluronic Acids (HA) and nano-Hyaluronic Acids: HA is a natural component found on skin. The duo-HA molecules instantly hydrate and lock-in moisture, keeping skin soft, smooth & bouncy. I used to use Dr.Ci:Labo moisturizer which is also a 5-in-1 product and I love it! It helps save my morning time and it’s really moisturizing! Although this product is only 3-in-1 BUT(!) it can be used as a SLEEPING MASK is a BIG wow factor to me already! I’ve always like gel-like product. They’re less oily and feels very lightweight! 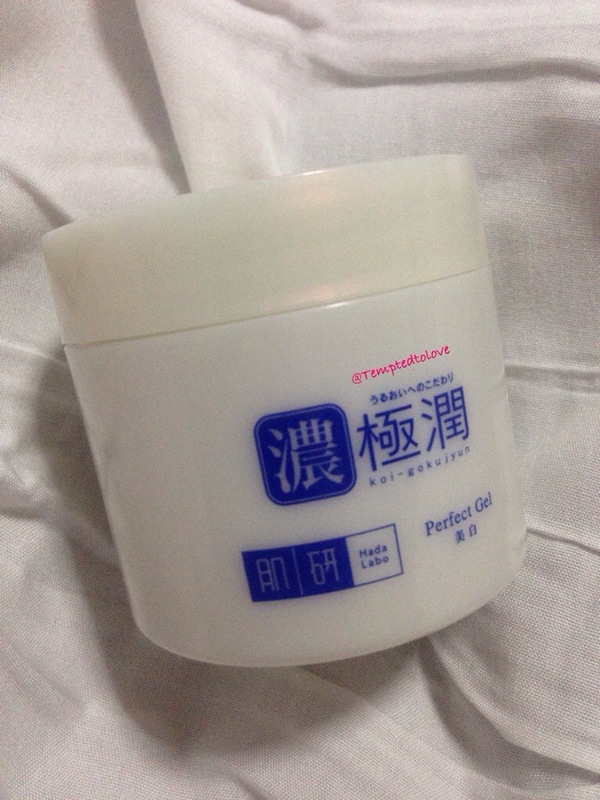 This is totally what I get from Hada Labo Whitening Perfect Gel! Light-wieght, non-oily, & it’s can be absorbed fast! I like that doink-doink action that all Hada Labo commercial show.. The first one that actually caught my attention is this…. 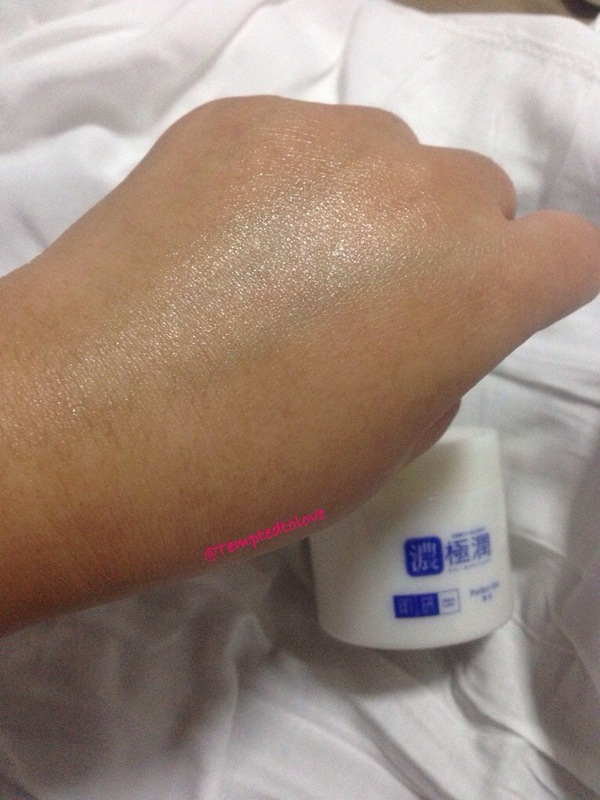 See how BOUNCY your skin can be after using Hada Labo!!!! 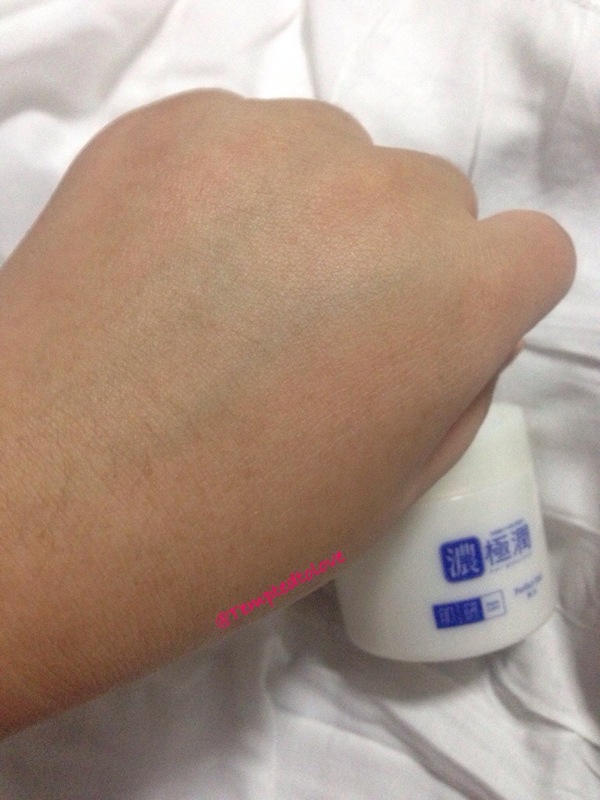 I tried it myself after apply my Hada Labo Whitening Perfect Gel and !! Hahahaha Doink-doink skin tooo!! Sorry, I haven’t figure out how to upload a video here so click above link to be re-directed to my instagram to see the short video instead!! Below is the product commercial.. Overall, I think this is a product worth getting! Love that it can be used as a moisturizer in the day and sleeping mask at night!! Because it get absorbs fast, I have no problem going to sleep with it as my sleeping mask! After a good night rest with my sleeping mask, my skin feel supple and refresh the next day!! Been almost 3 weeks since I used this gel and I can feel my skin is less dry now. 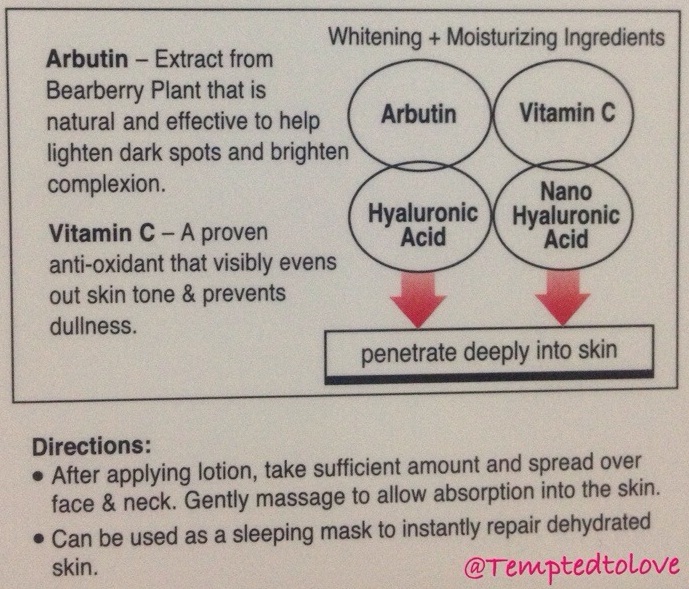 As for lighten dark spots, erm.. maybe I need to used it for a longer period.. you get what I mean~ LOL..
BTW, I shared some with one of my colleague who has got sensitive skin and she likes it too! 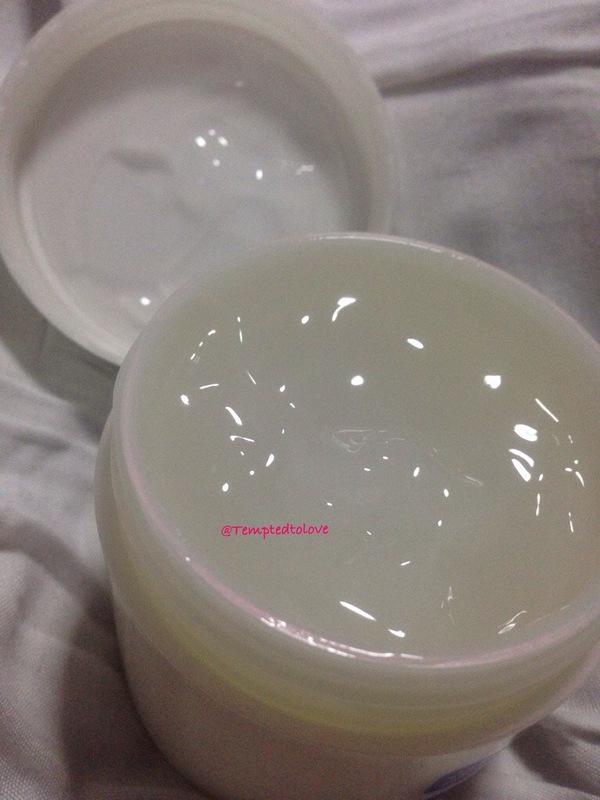 Her opinion is that this gel get absorbs into her skin very quickly and is non-oily! Another good thing is that it doesn’t cause redness/outbreaks on her. NOW.. here’s the deal…. Check out Hada Labo 3-in-1 Arbutin Whitening Perfect Gel Snow Princess game on Hada Labo Sg Facebook Page as you stand to win this product as well!!! Or go to SampleStore.com to redeem your Hada Labo Whitening Perfect gel sample now!! While stocks last! Can’t wait to get it already?? Drop by any BHG, Guardian, NTUC, OG, Robinsons, Sasa, Unity and Watsons to bring home one today!! Price @ $38.90/80g!! This entry was posted in .Care for Skin, Hada Labo, Sponsored Review and tagged face essence, face mask, face moisturizer, The Sample Store by Tempted to Love. Bookmark the permalink.